Exploring the riches of the eastern Andean foothills of northern Ecuador for numerous specialties at Wildsumaco Lodge. The upper tropical zone along the eastern base of the Andes has long been recognized as one of the richest ecosystems on Earth. However, reaching this zone has been difficult at best for many years, usually involving camping and/or long drives from the nearest accommodations in order to bird mostly along a road. Great improvements in our ability to "stay in the habitat"--a perpetual pursuit of birders--have occurred in recent years from southeastern Peru to southeastern Ecuador. But only with the opening of Wildsumaco Lodge, on an outlying ridge of the Andes near the base of Volcan Sumaco, have the riches of the eastern Andean foothills of northern Ecuador become comfortably available to birders. We'll be staying right in the habitat we want to bird, while eating well and sleeping in the comfort of a beautifully designed lodge, with an incredible view of the Andes. This lodge--at a perfect elevation (4600 feet or 1400m) and reachable from Quito in one day--is in a dreamy location. The panoramic view from the big deck toward the main cordillera of the Andes is truly awe-inspiring, and the quiet for sleeping is wonderful. Designed for birders by birders, it offers all the amenities that birders appreciate, but it's the birds that are the greatest draw. A great mix of cloudforest species, foothill specialties, and upper-Amazonian species, the avifauna here offers not only an abundance of birds, but many species that are genuinely rare or very difficult to see elsewhere. 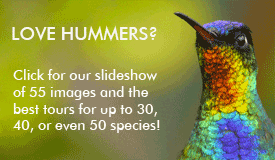 The lodge list now stands at 500 species, with some fabulous birds among them. 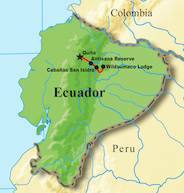 We have designed this tour to combine six nights at Wildsumaco Lodge with brief stops, en route, at Reserva Antisana (condor-inhabited paramo at the base of the snowcapped peak), a quick sip at the hummingbird feeders at Guango (upper montane humid forest), and a two-night stopover at San Isidro Lodge (representing mid-elevation montane forest). Of course the focus of our tour will be the upper tropical foothill forest flanking Volcan Sumaco. From here, on a clear day, we can see all the way back up to snow-capped Volcan Antisana and the origins of a birder's dream. Good accommodations, easy to moderate terrain, cool climate, moderate to high elevation.